For the last 2 years Archaeology South-East (ASE) has been working with the Environment Agency, Team Van Oord and the Chichester District Archaeologist, James Kenny to excavate and record an extensive archaeological landscape that is exposed as part of the Managed Realignment Scheme at Medmerry, West Sussex, UK. 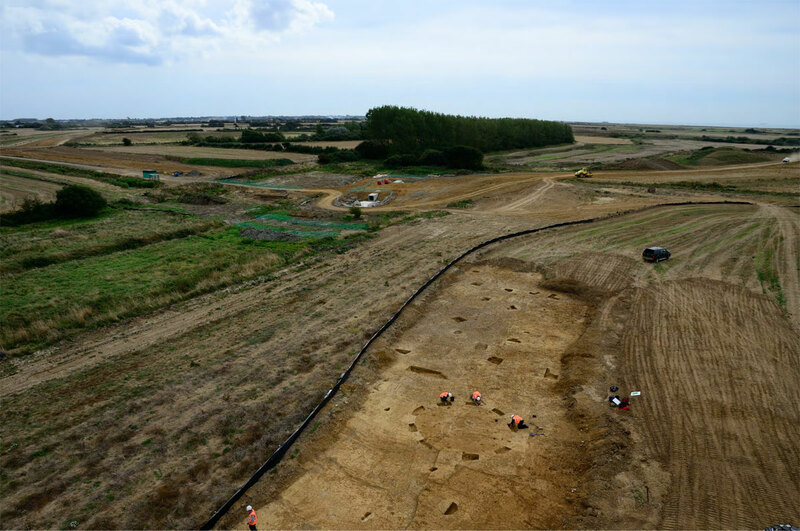 The archaeological investigation at Medmerry is unique in its scale (c. 50 ha.) and location, adjacent to the present coastline, which elsewhere has been left as farmland or obscured by development prior to the advent of developer funded archaeological research in the 1980s. The Neolithic represents a revolution in the way people lived in Britain with an abandonment of the previous hunter/gather way of life, for one linked to domestic animals and farming. Sussex has some of the earliest British Neolithic monuments (such as the Flint Mines at Cissbury Ring, Findon and Causewayed Enclosures at the Trundle, nr. Chichester) but information is lacking relating to Neolithic people’s daily lives and the impact they had on their environment. So far at Medmerry, several small assemblages of Early Neolithic pottery have been recovered from archaeological features. This has already doubled the number of known features of this date from non-monumental sites on the Sussex coastal plain and is an important development in understanding the evolving nature of the Sussex Neolithic. 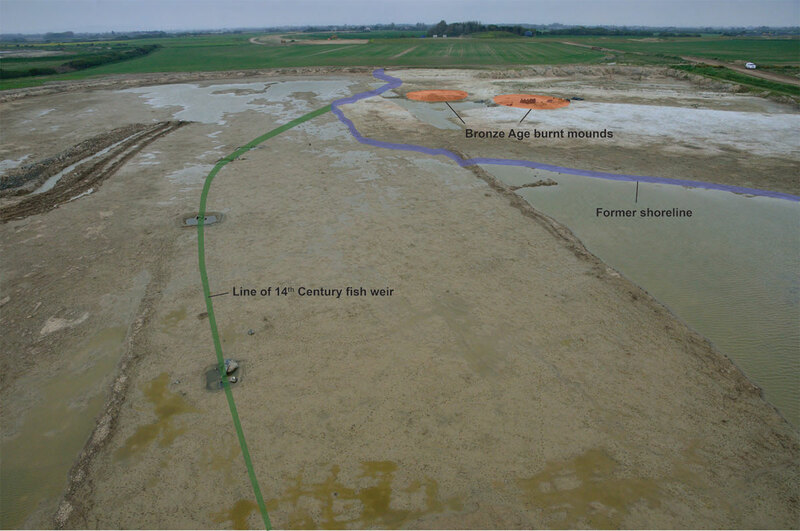 Results are preliminary, but the works appear to have revealed evidence of an extensive structured landscape during the Mid to Late Bronze Age focused on the light brick earth soils adjacent to what was a large estuarine system some 2-3km inland from the now eroded coastline. Finds have included extensive field systems and enclosures, more than a dozen roundhouses, eight well preserved burnt mounds, a cemetery containing c. 50 cremation/pyre deposits and well features, one of which contained preserved wattle work C14 dated to c. 1,100 BC. The burnt mounds are enigmatic features comprising large deposits of burnt stone used to boil water, where activities such a wool dyeing, beer making or even saunas may have taken place. Activity appears to have ended abruptly during the Late Bronze Age and it is hoped that environmental and dating evidence will help shed light on possible causes for this. These are extremely exciting finds and will provide an insight into the Bronze Age occupation of Sussex not previously possible until now. The Iron Age and early Roman remains uncovered to date are notable for their absence, with only one ditch in BP10 containing a single sherd of Iron Age pottery. This may suggest that the lower lying areas of the site were regularly flooded during this period making them unsuitable for settlement and other uses which would leave an archaeological signature. The area could still have been used as pasture and settlement in these periods, most likely lying to the north on higher ground. 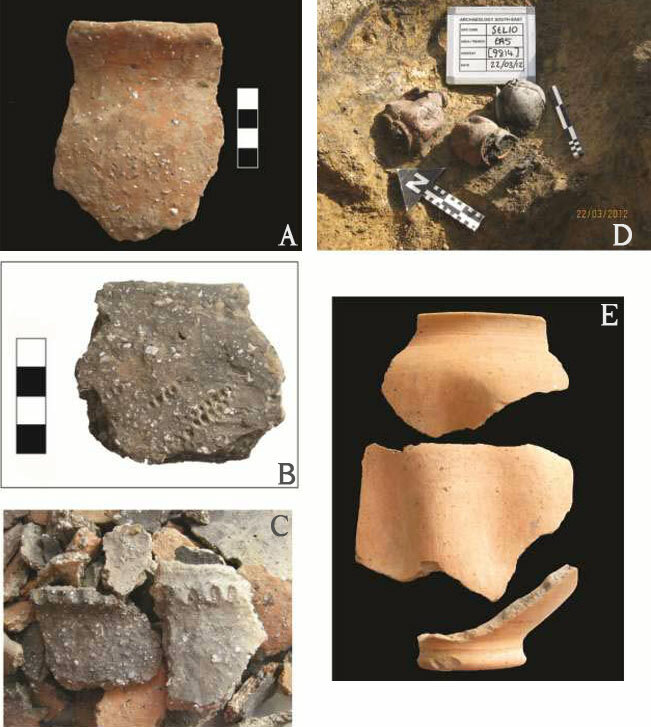 A large amount of mid Roman high status pottery, a cremation with ancillary vessels and a large mill stone recovered during the excavation of the V-ditch, suggest that there may have been a high status settlement near to the site during the later Roman period. 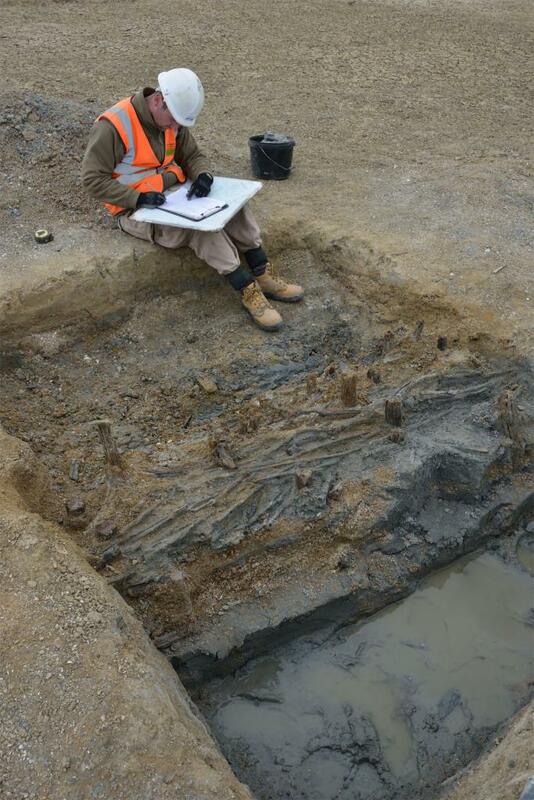 During excavations within a now silted river channel a series of timber uprights were recorded leading off the previous foreshore. This structure lay within 20m of two of the Bronze Age burnt mounds and a possible Bronze Age date was postulated. On closer examination the structure proved to be a wattle work fish weir preserved to c. 0.5m in height and some 160m in length. Despite its proximity to the prehistoric features, tool marks found on the structure suggested a later date, which was confirmed by a C14 sample providing a 14th century date. The fish weir suggests large scale exploitation of fish stocks at this time and was most likely organised under the auspices of the Bishop of Chichester. Whilst fish weirs of this date are known nationally no structures of this type have previously been recorded in Sussex. A series of enclosure and drainage ditches have been recorded across the site, most of which appear to confirm the presence of features recorded in the Yeake and Gardner map of the mid 18th century. The site contains several important WWII components, including a series of defences put in place to defend the south coast from German invasion, as evidenced by a series of pill boxes. Prior to the D-day landings the site was also developed as an air to ground gunnery range, training pilots ahead of military action in Europe. The gunnery range continued in use into the cold war period and some of the first jet fighters were tested on the site. Following the completion of site works in early September 2013 a programme of post-excavation assessment and analysis will begin, culminating in publication of academic and popular works in 2015. A series of new public access routes will be opened to the public in November 2013 when the site will become an RSPB managed reserve. The RSPB will include archaeology within its management plan and help tell the story of what has been found through onsite interpretation, guided walks and the internet.